Make the most of summer before it slips away: Embrace the heat at a pepper festival, or head to outdoor movies and concerts across the state. Enjoy traditional Appalachian music and dancing on the banks of the lake at this 48th annual festival. Revel in your North Carolina roots at this event, which includes food; camping; and traditional, old-time, and bluegrass music. Take part in music competitions, learn about flatfoot dance, and watch a concert featuring the Kruger Brothers, Dom Flemons, and more. At the opening reception for this new art exhibit at the Grovewood Gallery, 10 percent of all gallery sales will go to Arts for Life, a non-profit that provides art programs to children with serious illnesses and disabilities. Hear speakers, including author James Reston Jr., go to a banquet, and attend workshops and discussions at this literary event. Learn more: (828) 208-4731 or cmlitfest.org. See the work of the Wilkes County Quilters and enter to win two prizes valued at $1,000 and $500. Learn more: (336) 667-1121 or wilkesquilters.org. Larger-than-life jellyfish, dragonflies, tigers, lions, and rhinos — all lit from within — will cover acres of the Daniel Stowe Botanical Garden in Belmont during the Chinese Lantern Festival. The festival, which runs from September 7 to October 29, will feature live Chinese martial arts performances, food trucks, kids’ crafts, free kung fu coaching, and traditional folk art — along with more than 800 handcrafted lanterns. 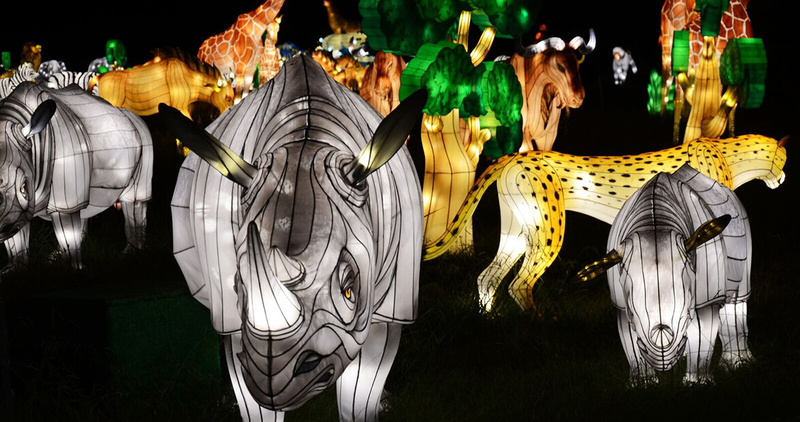 Combining movement, sound, and light, the lanterns will set the garden aglow in whimsical displays of wildlife from nearly every continent. Learn more: (704) 825-4490 or chineselanternfestival.com. Fall in love with the juried work of local and regional artists, ranging from jewelry to purses to pottery. Learn more: (828) 884-2787 or artsofbrevard.org. Help the Kings Mountain Historical Museum raise some funds — and maybe come into some money of your own — at the museum’s 14th annual fund-raiser. Try your luck at the reverse raffle, or participate in live, silent, and cake auctions. The event’s grand prize is $10,000. Run — don’t crawl — to this event, showcasing more than 50 juried artists in various downtown Statesville businesses. Talk with the artists, purchase a piece of art, or simply enjoy the creations of local artists. One hundred years after the United States entered World War I, the town of Hot Springs, which housed a German Prisoner of War camp, will host a festival featuring presentations by WWI experts, a documentary film about the town, photo exhibits, a wreath-laying by the North Carolina German consul, German-made artifacts, a self-guided tour of German sites, live music, beer, and food. Learn more: (828) 622-9932 or hotspringsnc.org. On the 47th annual Girl Scout Day, explore Grandfather Mountain’s ecological wonders, take part in scout activities, see presentations, and unite as one sisterhood. Buy fresh apples by the bushel, and enjoy live entertainment, kids’ activities, homemade crafts, and more at the 45th Lincoln County Apple Festival. Don’t forget the homemade apple pie. Learn more: (704) 530-4636 or lincolncountyapplefestival.com. Go back in time to the 1780 battle against the British, a turning point in the Revolutionary War. Talk with colonial reenactors and take part in demonstrations before watching the battle. This fourth annual bluegrass and Americana music festival will feature 12 bands. Learn more: (828) 295-4812 or theblowingrock.com. You’ll have the time of your life at this outdoor screening of Dirty Dancing. Bring a chair or a blanket and enjoy the 1980s classic. Learn more: (828) 433-7469 or commaonline.org. Make your way to scenic downtown to explore more than 14 art galleries. Sip wine, listen to music, and appreciate local art. Line up for this festival, which will feature contra dancing, workshops, and craft vendors. Festivalgoers will be treated to live music — including the second annual NC Banjo Competition — local beers and wines, and grub from food trucks competing in the Fall Food Truck Competition. Take a self-guided tour of western North Carolina artists’ studios. Visit more than 30 fine art or craft studios — showcasing more than 50 artists’ work — and see where the artwork is made. Learn more: (610) 917-1066 or hcost.org. If you’re looking for the perfect excuse to get the kids out of their rooms, then unplug the video games and get ready for a night under the stars. A ranger will help set up camp and build a fire, and will also camp out in case anyone needs help. Make your way to Matthews’s annual festival, full of food and family-friendly fun. Attendees will be treated to music, rides, and arts and crafts. Learn more: (704) 708-1261 or matthewsalive.org. On your mark, get set, go — to Fit & Able’s annual race to run, swim, and cycle. But for those not feeling quite fit or able enough, the fitness-oriented nonprofit is also introducing a splash-and-dash race this year. Learn more: (919) 673-4685 or runsignup.com. Now in its eighth year, Hopscotch features local, national, and international bands in a variety of genres, from folk and rock to hip-hop and pop. More than 130 bands play in venues across the city — indoor and outdoor — all within walking distance of each other. The 2017 lineup includes a number of larger, well-known acts, but 20% of its lineup is comprised of local bands from all over North Carolina. Learn more about this year’s local artists here. This large-scale, three-day outdoor event celebrates the roots, richness, and variety of American culture with live music and dance performances, a marketplace, workshops, demonstrations, and more. Head to the Mayo Lake Amphitheater to hear bluegrass music from five great bands. Learn more: (336) 322-2105 or piedmontcc.edu. Celebrate grandma and grandpa’s special day: Explore the historic site, lay out a picnic, and get a family photo taken at Town Creek Indian Mound. Downtown will be transformed when thousands of people arrive for music, food, rides, and Clayton’s Next Big Thing talent competition. Learn more: (919) 553-6352 or claytonchamber.com. In this comedic play, Della, a baker, is forced to reconsider her strong beliefs after the arrival of her late friend’s daughter. Get a look at rising talent in the film industry at this three-day festival. Learn more: (704) 873-6100 or fullbloomfilmfestival.com. Help the Carolina Ballet kick off its 20th season at this performance of the classic tale. This sixth annual concert at The Farm will be headlined by country star Justin Moore. Learn more: (919) 750-5464 or thefarmnc.com. Experience traditional Native American songs, music, and dance at this family-oriented event. Food and drinks will be available, along with arts and crafts. Learn more: (980) 777-8671 or cabarruspowwow.webs.com. Spanish cuisine meets North Carolina ingredients at this weekend getaway. Featured chef Katie Button will offer tips, tricks, and tastes; local potters and an area coffee expert will also talk about their crafts. Learn more: (888) 685-2438 or pinehurst.com. Head to the Little Neuse Theatre to watch this comedic play, which tells the story of a ragtag team of trailer park residents who fight annexation. Take a peek at what downsizing might look like at this meeting of small and tiny house experts, architects, and enthusiasts. There will be workshops, demonstrations, and a tiny house village to tour. Run this seventh annual 5K and help a hero get a home. Race profits will support Operation: Coming Home, an organization that gives wounded servicemen and women houses free of charge. Take your ears and taste buds on a trip around the world at this festival: Sample foods from all over the world, take part in a silent auction, and enjoy free entertainment. Learn more: (919) 365-711 or thefoodfestival.com. Commemorate the 500th anniversary of the Protestant Reformation at this festival, where attendees can try their hand at colonial beer making and woodworking, among other activities. Take a trip back to the ’70s — if only for a night — with the 7 Bridges Band’s tribute to the Eagles. Learn more: (910) 365-9890 or vision4moore.com. Head to historic Main Street for food, plenty of live music, and fun activities. Learn more: (919) 528-3332 or cityofcreedmoor.org. Heat up your weekend with live music and Texas Pete-inspired dishes in the birthplace of the famous hot sauce brand. Learn more: (336) 728-4200 or texaspetefest.com. Expect fine visual art, food, dance, and music at this festival located in Durham’s historic city center. The two-day event will showcase 145 visual artists from around the country, and will also feature live entertainment from North Carolina-based performing artists. Learn more: (919) 560-2787 or centerfest.durhamarts.org. Perfect for history lovers: Regional scholars will discuss the effect of World War I on North Carolina. Watch a rodeo in action; dance; or just sit back, relax, and listen to a bluegrass show. Learn more: (919) 894-3825 or bensonmuledays.com. Sweet Potato Pie — the North Carolina-based bluegrass band, not the dish — will kick off Music for a Great Space’s female-powered music series, Season of Women in Music. Get a taste of more than 30 cultures downtown at the Arts Council’s 39th International Folk Festival with Compare Foods, which will boast authentic cuisine, live performances, and arts and crafts. Head to the Gilbert Theater’s production of Evil Dead: The Musical, a farcical take on the 1980s Evil Dead movies. Learn more: (910) 678-7186 or gilberttheater.com. Support the North Carolina zoo at this event organized by Randolph Friends of the Zoo and the North Carolina Zoological Society. Dance, eat, and take part in live and silent auctions. Learn more: (336) 879-7262 or nczoo.com. An important farm town hub for nearly 100 years, Selma hosts Farm Day with the Kenly Tobacco Farm Life Museum, which will have a variety of farm crafts, tools, and crops on display at the Town Hall gazebo. There will also be an architectural scavenger hunt that will focus on the town’s various building styles throughout its history. Learn more: (919) 965-5529 or visitselma.org. Learn about other cultures and enjoy live music by bands like enVision and Sahara Reggae Band. Learn more: (336) 883-3124 or highpointnc.gov. The U.S. National Whitewater Center hosts this wine festival featuring a variety of local, regional, and national wines for guests to sample; live music; and a trail race. What’s life without a little spice? At this 10th annual festival, chow down on pepper-themed dishes from the state’s top chefs. Listen to music, watch chefs compete, and maybe even indulge in a peppery adult beverage or two. Learn more: (919) 533-5181 or pepperfestnc.org. Make your way to St. Alban’s Episcopal Church to see mandolin and guitar virtuoso Robin Bullock play a collection of classical and Celtic music. Learn more: (704) 560-0101 or musicatstalbansdavidson.org. Help protect farmland and promote sustainable farming by enjoying good food, beer, and live music. All proceeds will go to the Carolina Farm Trust. Learn more: (704) 264-6088 or thecarolinajubilee.org. Enjoy the green grass and sweet flowers of some of the city’s best gardens, along with a complimentary lunch with the purchase of a ticket, at this event put on by the Fuquay-Varina Garden Club. Learn more: (919) 744-4274 or fuquayvarinagardenclub.weebly.com. Experience the sights and sounds of summer: Listen to a free concert by beach music group The Entertainers, just a block away from Ocean Isle’s sand and surf. Bring a blanket or a chair, sit under the stars, and watch a tale as old as time on the big screen at Soundside Park. Learn more: (910) 328-4887 or surfcityparksandrec.com. Rock the night away at this show, featuring tribute bands performing hits from rock legends Aerosmith, Journey, and Bon Jovi. Learn more: (252) 473-7326 or itsallgravyobx.com. Sample the Southern staple, check out an arts and crafts show, and enjoy live performances by bands like Fantasy and Band of Oz. You can even try your hand (or, rather, mouth) at the collard eating contest. Learn more: (252) 531-3313 or aydencollardfestival.com. This two-day cycling fund-raiser begins and ends each day at Union Point Park, and helps fund MS research and programs. Pick from routes of 30, 50, 75, and 100 miles, with rest stops and lunch along the way. At the end of the day, head to the downtown waterfront for food, drinks, and live music. Help First Presbyterian Church celebrate its 200th birthday by attending a sanctuary concert put on by the Carolina Chamber Music Festival. Folks will come together in hopes of a more harmonious future at this local observance of the international holiday. Sing and dance to songs about peace, and pick up some educational literature. Escape the hustle and bustle of the city (or the suburbs) and make your way to this festival for a taste of a different kind of life: Tour Brock Mill, which was built in the 1700s, learn how to milk a cow and loop tobacco, view a vintage car show, and listen to live music. Learn more: (252) 448-9621 or jcheritagefestival.com. Traditional, old-time, and Appalachian music will take center stage at this concert; lead singer April Verch will sing, dance, and play the fiddle — and sometimes, she’ll even do all three at once. Enjoy classical music performed by the talented 14-year-old cellist Ifetayo Ali-Landing at this concert, but beware: It may leave you feeling a little less accomplished in your own life. Learn more: (910) 362-7999 or wilmingtonsymphony.org. Get in your Jeep and head to this car-centered celebration, which will span six towns and two counties. Take part in a trail ride or an obstacle course, or relax at a beach party with live music. Learn more: (910) 329-4446 or topsailislandjeepweek.com. The spotlight will be on the tasty spot fish: Eat your fill, listen to live entertainment, and watch a fireworks display. This fall arts festival on Pamlico Sound will showcase juried artists from near and far. Enjoy live music, dancing, a craft beer and wine garden, seafood vendors, and games like a fish toss. Learn more: (252) 926-2787 or mattieartscenter.org. Get lost in wines and fine foods from around the country at this festival held at Waterside Theatre, which will also feature live entertainment and seminars. Learn more: (252) 473-2127 or tlcwinefest.com. Celebrate at Center Stage Theatre’s 40th anniversary concert, featuring songs from some of CST’s most popular shows. Learn more: (919) 583-8432 or cstheatre.org. At this eighth annual event, take a ride on a boat, watch a boatbuilding demonstration, build your own boat model, talk with wooden boat owners and makers, and then head over to the chowder tent for an award-winning bowl of seafood chowder. Learn more: (910) 477-2787 or southportwoodenboatshow.com.